Festival of New Trumpet Music begins tomorrow! 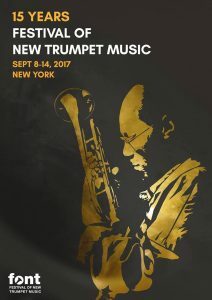 This year’s Festival of New Trumpet Music takes place September 8-14 in New York City. Curated by Dave Douglas, Keyon Harrold, Stephanie Richards, and John Blevins, the festival includes events nightly at venues around the city. Check out the list of events below and get your festival pass or individual tickets now! Dave Douglas Presents: 15 Years of FONT Music with Stephanie Richards, Jeremy Pelt, Nate Wooley, David Adewumi and more! Panel Discussion on Creative Self Determination for Musical Artists with Charles Tolliver, Dave Douglas, Keyon Harrold, Meghan Stabile. Curated by Keyon Harrold with Marquis Hill and Maurice Brown. World premiere of new music by Keyon Harrold, funded by FONT Music’s Roy Campbell, Jr. Commission. Music for Wing Walkers + FONT Music featuring Oskar Stenmark Quartet, Danny Gouker’s Signal Problems, and the Wing Walker Orchestra featuring Jonathan Finlayson. Music for Wing Walkers + FONT Music featuring Allison Philips Trio, Jason Palmer Quintet, and the Wing Walker Orchestra featuring Jason Palmer.